« Win a Cuisinart ICE-100 Ice Cream Machine! The last copy of The Auberge of the Flowering Hearth that I had, I’d lent to a good friend who was excited about starting a career in cooking at a local culinary school. I don’t know another book that captures precisely everything I love about cooking, written by a man truly passionate about his subject, and I though he’d like to read it, as it’s been very influential to me as a cook. Then I moved and never got it back. But it was the one time in my life that I was happy someone else had become the owner of one my books, because it’s one that cooks of our current generation have likely forgotten about, or never heard of in the first place. Fortunately last summer when I was in New York, I went to browse the shelves at the great cookbook store – Kitchen Arts and Letters – and saw a brand-new copy, and picked it up. It’s one of those rare books that I can read over and over and over again, and never get tired of, so I can’t imagine not having it on my shelf to pull out whenever I want. And re-reading it again, in France, reminds me of how Roy Andries de Groot, the author, was so perfectly able to capture a place, and time. L’Auberge de l’Atre Fleuri was a rustic mountain inn run by two women, Mademoiselle Ray and Mademoiselle Vivette, who had the kind of place we all dream about happening upon, but no longer exists. The two women were dedicated not just to splendid cooking, but were fastidious about using the bounty of the mountain-walled valley, and the fields, lakes, and forests, that were guarded by those towering mountains. In the last version of the book, still miraculously in print, the author prefaces this edition, (in 1982) noting with a little consternation that after the book came out in 1973, the auberge was eventually sold and the new owners had no connection with the previous ones. And not to expect them to have the same dishes on the menu or even anything remotely resembling the place where he spent so much time cooking, marketing, and routing through the wine cellar with the two women. Due to the popularity of the book when it was published, after the auberge changed hands, the new owners started automatically sending inquires from Americans a form letter informing them of both the changes in the restaurant, many of which were prompted new restrictive laws in France regarding hunting and foraging, hence many of the dishes from the original auberge could no longer be prepared. As people moved, or passed away, the valley changed, commercial ventures moved in, ski resorts opened up, and, well, life anywhere goes forward in various directions. De Groot called this book “an unchanging record of a lovely way of life in an extraordinary place at a particular time” and talked in his introduction about how many readers have gone and found the place changed, and the people mentioned in the book no longer there, many suggesting it was a fabrication. But the book captures a very certain, and very special, time and place that occurred, and reads like a delicious dream, recounting multi-course meals starting with aperitifs served around a blazing hearth, made with the local liqueurs prepared with herbs and berries foraged from the nearby mountains. Lunches and dinners are brilliantly recounted, which may have started with flaky tarts made of Roquefort cheese, tiny purple-tinged artichokes bathed in olive oil, and rich, meaty terrines of wild game. Pan-fried fish caught in the cold streams get paired with crisp Alsatian rosé, sparkling wines from the alps gets served as a pre-dinner apero, and marvelous wines from the Rhône and the Loire, are plucked from the women’s extraordinary wine cellar, each having a story about the producer of the wine and what made it just the right choice at the time. The author spent a number of summers with the women, writing about the auberge, and translating the dishes into recipes for home cooks. Granted nowadays, few people sauté green beans in heavy cream…and butter…then finish the dish by thickening the sauce with a couple of egg yolks. If there is a chef in France that still goes out and picks their own wild dandelion greens, I am on the next train to meet her. And I am fairly confident that no cookbook editor would allow a recipe for grilled saddle of chamois (mountain antelope, which I’m sure should be freshly hunted) in a book. Truthfully, I’m not sure I’m ready to tackle either of those recipes, but what’s not to like about a recipe for Boeuf en Daube (beef stew) where instead of an exact yield, it says; “Not worth making for fewer than 8, but improves with keeping” ? But wherever I’ve asked – at markets and from farmers in France – my inquires only yielded funny looks, as if fresh angelica was the oddest thing in the world. Perhaps angelica is one of those ingredients that was a victim of those restrictive laws? As we drove around town, no one had the foggiest notion what I could possible want to do with fresh angelica – even when I explained it – or even where to get it. So we hit the tourism office where I picked up a few stalks of the candied stuff from their small boutique to bring home with me, since I don’t like going home empty-handed. If you’ve ever seen that bright green candied fruit on a cake, it’s angelica, a stalk that resembles celery a bit. And if you ever find it fresh in Paris, please let me know! The angelica I bought had no coloring added, hence the pale green color. It has a herby, wild flavor and is often used to flavor vermouth, in addition to Chartreuse. I finely chopped part of one of my stalks and added it to this cake, which Mr. de Groot says he prefers unadorned. Modern tastes have changed and I liked the aromatic addition of the herb. 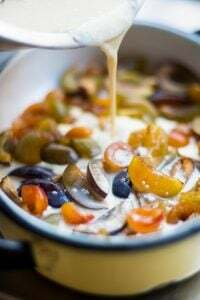 But one could easily add chopped candied citrus peel, or fresh zest, as well as a soup spoon of fresh lemon juice into the batter. The auberge may be gone, but because I have a real sentimental soft spot for this book, and the food presented in it, it was a joy to recreate this classic French cake in my present-day kitchen. (Because if I can’t find angelica, I doubt that fresh antelope meat is going to be any easier to come by.) It’s great paired with summer fruits and berries. Because it’s the season, I made a compote of sautéed fresh cherries by warming pitted cherries with a generous handful of sugar in a covered saucepan until very soft and juicy, about ten minutes, then added a shot of kirsch added at the end. 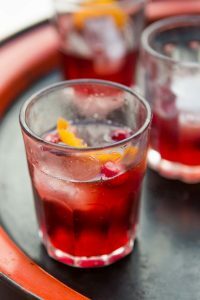 If you prepare the cherries a few hours before you plan to serve them – or even the day before – the cherries get much more flavorful and the juices thicken into a glistening ruby-red sauce as they sit. Adapted from The Auberge of the Flowering Hearth (Ecco) by Roy Andries de GrootI adapted the original recipe and lightened it up, reducing the amount of flour, resulting in a moister, lighter spongecake. It really helps to have a second mixer bowl and whip handy. But if you don’t, use the stand mixer for whipping the yolks, then whip the egg whites by hand in a separate bowl. If you don’t have a stand mixer, you can use a little moxie and beat everything by hand.Cream of tartar helps stabilize the egg whites, which I bring over from the states since it’s not used in France. It can be omitted if you don’t have it. Similarly, instead of candied angelica, you can flavor the batter with a few generous swipes of fresh grated lemon or orange zest and a squeeze of fresh lemon juice. 1. Toss the angelica with a bit of the flour to separate the pieces and set aside. 2. 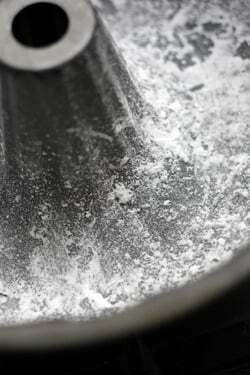 Butter a 10-inch (27cm) bundt pan and dust the inside with powdered sugar, then tap out any excess. 4. 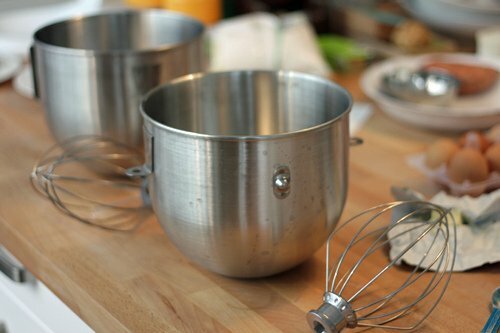 In the bowl of a stand mixer, stir together the egg yolks with the sugar. Whip the yolks on high speed until thick and lightened in color. With the mixer running on high speed, dribble in the very hot water, a few teaspoons at a time, then add the vanilla. 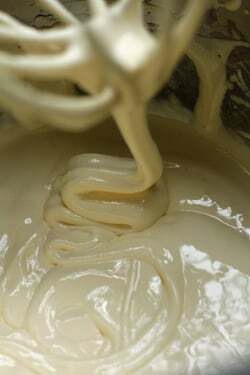 Continue whipping until the mixture has rethickened and resembles soft pudding, holding its shape when you lift the whip. 5. In a separate bowl, whip the egg whites with the salt and cream of tartar until they hold stiff peaks. 6. Put the cake flour in a mesh strainer or sifter, and sprinkle the flour over the yolks, folding it into the yolks gradually as you sift. 7. Stir in the candied angelica then fold in one-third of the beaten egg whites until fully incorporated. Then fold in the remaining egg whites. 8. 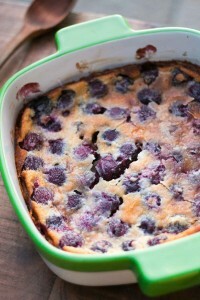 Scrape the batter into the prepared pan and bake for 1 hour. It’s done when a toothpick inserted into the center comes out clean, with perhaps just a few crumbs attached. Remove from oven and immediately turn the cake out onto a wire cooling rack. Let cool completely before slicing. Storage: The cake will keep for up to three days at room temperature. It can also be frozen for up to two months. *Cake flour is a lower-protein, slightly acidic flour, which results in a much lighter cake than regular all-purpose flour. It makes a difference in cakes like this. Although it doesn’t have quite the same result, you could use 1 cup (140g) regular flour and substitute 2 tablespoons of the flour with 2 tablespoons of corn starch. ….mainly in the Marais Poitevin, a marsh region close to Niort in the départment Deux-Sèvres. How interesting, I am Irish and I’ve seen Angelica growing wild many many times in Ireland, but I never knew what it was called or that it could be used in this way. Thank you David. BTW if you want some, maybe the fields and hedgerows would be the place to look not markets – you could do some personal foraging! Dave… It’s so clear why you are in love with your art… This is a beutiful piece.. I’m going to that bookstore today… First time.. I just looked it up — it’s that plant with the clusters of tiny white flowers? I think that one can be found just about everywhere! I remember as a kid my parents would tell me that one was a gross plant, it attracts flies. No it’s not the one with clusters of tiny white flowers that grows everywhere! That one is poisonous!!! It grows in wet boggy areas – hence the Marais as the growing region. Preserved angelica is brilliant for motion sickness and nausea also. I add it to my Christmas cakes each year, and have a bottle of angelica liquer that I drizzle on ice cream in summer for a lovely fresh taste sensation. It is the best candied fruit there is in my opinion. see: http://www.simtwobirds.com, where you are featured as a link. I love that book — isn’t it dreamy? And to me it’s even more romantic that the auberge is lost to the figment of memory. I had fresh angelica once in a special cake from the Charente-Maritime. Our hostess kept the angelica locked away in a special box and said it was very difficult to find. I have read AOTFH every couple of years for ages. It’s so evocative of a lost time, and brilliantly written. I get nostalgic and hungry every time I pick it up. Best read in the winter I think. That book sounds like a wonderful read! And this looks delicious. I will be sitting (panting) at my front door waiting for the box to arrive from Amazon. What’s funny is that I actually ordered the book last night, before I read your post. I had been looking for some older food memoirs and books and stumbled on that one while looking through the Canal House books list. I also just happen to be in NYC for a week so I’m definitely going to stop by that bookstore. Wonderful post David, can’t wait to try the cake. I’ve never been able to make a stew for fewer than 8, so that’s not a problem. Tracking down antelope, however, could stump me as well! David, I also love The Auberge of the Flowering Hearth for the passion it conveys and the glimpse of another world. So, I enjoyed this post very much. Have you ever used angelica seeds? They are a common flavoring in Iranian cuisine, and the seeds have a beautiful floral-musky flavor with a hint of celery and anise. No, I haven’t ever seen them. But they sound lovely. There’s a Iranian store in my neighborhood and next time I go by, I’ll stop in and ask about them. Thanks! I agree with the other commenters, this post is lovely and well written! And the sautéed cherries look excellent. Thank you for this post, I could see, smell, and taste every description. Dear David,beautiful writing and thank you for the recipe.Thank you. When you visit New York, have you been to this store. It is just north of Canal Street and loaded with old cookbooks of all kinds. I stumbled on it a few years ago and have induldged myself. David, I share your sentiments about this great book – it truly transports you to another time and place. I was astonished to learn that the author, Roy Andries de Groot was blind when he wrote it. Apparently he travelled with an assistant who described to him the visuals, but it was obviously the author’s keen palate, his sensitivity to the tastes, aromas, and sounds, and his ability to write the stories told to him by these local people that created such an enchanting book. It’s a pretty great book and the fellow at Kitchen Arts and Letters told me he was surprised that it was still in print, as well. It’s a pretty amazing story and he was a great writer, and it’s hard to convey the beauty of his words and the book here – but for folks interested in food, and especially country French cooking, it’s a classic for a reason. 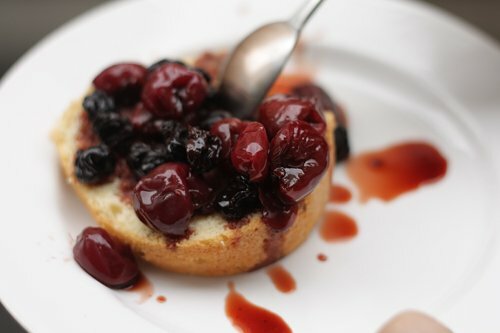 You had me with the photo of the cherries on top of the cake…I love to make sour cherry preserve at this time of year. Thanks for the link to Amazon–I just bought the book for the pure pleasure of reading it this summer. Lovely post. Thanks. I purchased “Auberge of the Flowering Hearth” a couple of weeks ago after reading about it in Richard Olney’s “Reflexions”. I am saving this book for a day when I can read without interruption and be transported to an earlier time! David, your blog brightens my day! Your humor and appreciation for life and food shine through. Richard Olney is another excellent writer. I haven’t read Reflexions, but should put it on my list. 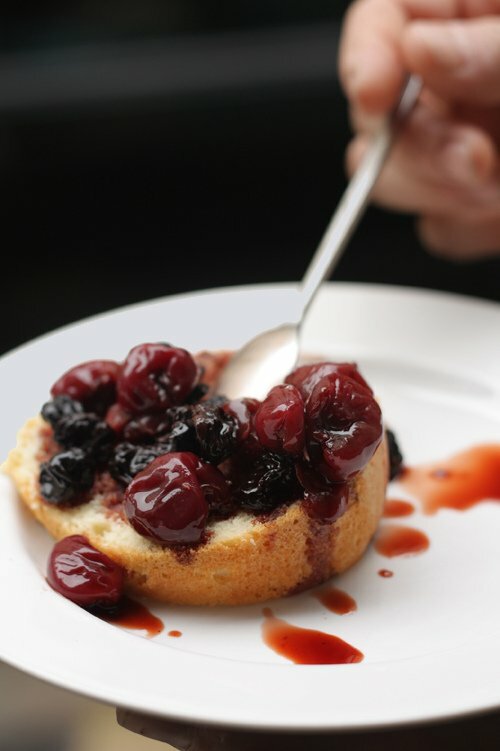 Love the cherry compote with this cake – perfection! Angelica is often grown in cloister gardens. If you speak to gthe monks I am sure they will share some. Lovely piece of writing. Am ordering the book right now. A chef/friend here in Paris that buys herbs direct from an actual grower told me he’s going to ask them for some. dear david,i go frequently to pick my own dandelions for my dinner club. but as it is in vienna, i guess you will not come over…. and now i will look to find angelica to! That is my favorite book because I have lived for 2 years at the foot of the Chartreuse in Grenoble and even though the many B&Bs I have stayed at all over France do not have the type of cooking Mademoiselle Ray and Mademoiselle Vivette come up with, it definitely transports me to that time and place where cooking and eating are done with passion! In our generation, we eat and run, with no time to spend picking the best produce at the market, cooking them with love, and taking the time to sit down for several hours to slowly savor the meal and talk about it. Sadly, the interest is not there. I hope that generation will return and cooking and eating will once again be an activity of the passionate! Thanks for your romantically written posting. Thank you for writing about this wonderful book. I treasure my copy too as well as very special memories of dinners with Roy Andries de Groot. He was a brilliant writer and conversationalist. His descriptions of food and his palate was unsurpassed, all the more impressive because he was blind. My goodness, Daube is wonderful. As I had the chance to spend my 21st birthday in the Paris suburbs with my grandparents and family, I asked for that dish at dinner! I helped make it, and while it took a while, it was absolutely worth it :) I know it only got a passing mention in the blog entry, but I couldn’t help but comment! I think it might actually be easier to find fresh antelope mea than angelica. :). great story and recipe. I’m now intrigued to find out more about the history behind chartreuse. The old “Auberge of the Flowering Hearth” is treasured as one of the prized possessions in my cooking library. I too, read it periodically to refresh my interest in culinary lore from this corner of the world and am quite happy to have an interpretation of the Gateau de Savoie. I will make the cake for a birthday party and it is sure to be loved especially as cherries are in season and my guests are French. Thank you David! You are responsible for a new interlibrary loan request for my stalwart librarian to fulfill. I’m sure she’d thank you, if she knew. Angelika root (Angelica archangelica) grows, as said in other comments, in marshy areas. It’s easily misidentified with poisonous plants that has a similar appearance. If foraging, only pick what you know for certain to be actual angelika root. Great post on L’Auberge. Can’t wait for my copy to arrive. Did I read in an Amazon review that DeGroot was blind? Such a lovely place in time. So many wonderful things don’t persist when the people move on. I think of Lulu in Richard Olney’s book, and wonder if any women have bucked convention and still cook in her spirit. I have a kitchen garden, and shop in season, but I can’t touch her menus (grand aioli with octopus, fresh fish – not available to me, great bread – no time) and I don’t have her energy or her experience. 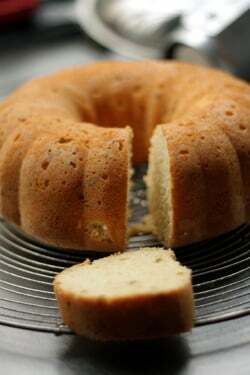 As to this cake, perhaps lemon verbena (I grow it) would work in place of candied angelica with its nice grassy flavor. I’ll just have to plant an angelica! Thanks for this wonderful post. When I read this book for the first time, it’s like finding Shangri-la hidden in the mists. My favorite recipe from the book is the Flaming Ice Cream Mountain of Chamechaude (Le Chamechaude Flambe). I wish someone on Food Network would attempt to make it. I think all of the ingredients are findable today and it’s one of those recipes that probably takes all day long to make, but doable if you make it in sections. Mademoiselle Vivette wanted to make a large desert for a wedding party, so decided to make a model of Chamechaude in various colors and flavors of ice cream. After it was decorated with green sticks of Angelica to represent the trees, & glaceed fruits for the flowers & nougat for the rocks, along with icing sugar & whipped cream for the snow, she poured brandy over the whole thing & set it a fire–whew..what a dramatic desert!! I love the way you wrote about this book, and it is just the way I feel about Madeleine Kamman’s wonderful book “When French Women Cook” which I read for the stories of French women she has known and who shared cooking with her, as well as the techniques and recipes. Thank you for this post. I have treasured this book since I first read it. It’s all the more amazing because I read that de Groot was blind. Yes, I love When French Women Cook. I read cookbooks like steamy novels, they are piled up on my night stand and in my kitchen, and that book is a wonderful read. Oh, I love that book and have re-read it many, many times, finally getting one of the newly published ones, since I’d been lugging it home repeatedly from the library for years. My other favorite to re-read like that is Honey From a Weed, which also evokes a time and place so wonderfully. 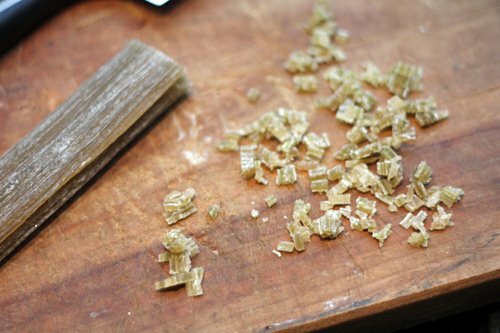 I’ve actually got some candied angelica in my pantry . . . hmm. I’ve grown angelica when I’ve had a garden, though it does require a bit of space. You’ve hooked me, all over again – simple beautiful! Immediately, I scurried to my bookshelves…wanting to verify that my own copy of ‘The Auberge…” had not gone astray during my recent move. Ah! there it was! Whew! Always a charming read. Recipes are easy to follow and recreate. In addition, I remembered having had the opportunity to speak with Nach Waxman—owner of Kitchen Arts & Letters in Manhattan about other food books I was interested in…he is passionate, enthusiastic and knowledgeable. What a fabulous resource for great and often hard-to-find books on cuisine! Simply brilliant, David. Fascinating and heartfelt. I am so happy that somebody else appreciates The Auberge of the Flowing Hearth. I’ve had it for years and have read it cover to cover, I must admit, with some jealousy. It’s a real treasure. Oh, yes, and it reminded me of another book that’s pretty weird and wonderful. It’s by Robert Courtine and is called The Hundred Glories of French Cooking. Lots of ye auld recipes, such as Ortolans a la Robert Laporte (hmmm, I thought eating ortolans was illegal)m Ris de Veau Clamart, and Lievre a la Duchambais. Fun to look at. Have not made many of the recipes..
Hey Dave, Angelica often grows along (and in) slow moving rivers. Would you believe that I’ve seen it in the eastern parts of San Diego? (Not sure if it’s native?) Maybe it’s time for you and your love to take a country road trip and do a little walking amongst the trout and willows and see what you can find. Good luck. i just bought a small potted angelica at a plant nursery here in New Mexico. Will plant and then figure out the best way to preserve it in the fall. Always wonderful to read your blog and am enjoying your books. David, I love your article and I look forward to reading the book soon. 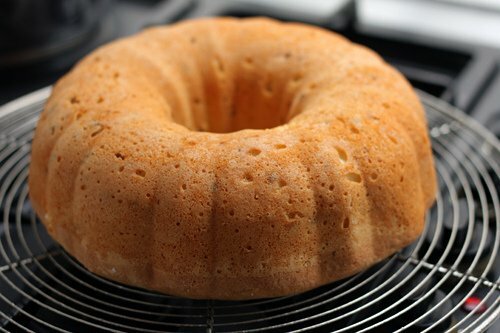 A question…can this cake be made in a small form factor, such as cupcake pans, etc? It looks like your picture shows it in small rounds. How would I change the cooking time if I used either cupcake/muffin pans or small metal rounds for this recipe? You would definitely cut down the cooking time. I can’t say for sure, as I haven’t baked them in a smaller pan, but just bake them until a toothpick inserted in the center comes out with a few dry crumbs attached. It will be substantially less (the cooking time) than indicated for a larger cake, such as this. In the US, in many communities are cooperative extensions, especially if there is an agricultural university or institution in your area and they can identify plants. You could also bring a leaf to a local plant nursery. If you do, put it in a zip-top bag as nurseries are wary of people bringing in plants, as they may have insects or other maladies. It the iranian shop doesn’t carry the seeds you can try most of any herbal remedy shop. They’re used in herbal medicine. A week ago my husband and I visited La Patisserie by Cyril Lignac. Just up the street is a small park. Go through the park gate and down the path and look on the left. In one of the plantings you will see an umbrella-esque plant, and I swear it is angelica. Or at least it looks and smells exactly like the angelica I planted some years ago. Good luck, and thank you for all of your wonderful stories and advice! Thanks for the tip! There’s a community garden over there, so I wonder if someone is growing it. A friend has a plot over there, so I’ll take a look. Hope you liked the pastry shop – I love their croissants! I am sitting here in freezing Melbourne reading your wonderful post and now I feel warm! Lovely post. l’Auberge de L’Atre Fleurie, one of the books that inspired our fantasy of opening a French restaurant in the 70’s. Thank you for a heartfelt reminiscence. I wonder if you could candy loveage? Grows profusely and shares a similar taste and appearance. Merci. You can pretty much candy anything. Just brush the leaves with a bit of egg whites that have been broken up with a fork, with the lightest coating possible (and if you’re concerned about using raw eggs, you can use powdered egg whites, or buy eggs from a trusted source). Then sprinkle the leaves with granulated sugar, shake of the excess, then lay on a cooling rack until crisp. They should keep for a few days. Beautiful. Thank you for both the post and the book citation. Hey, ‘Honey-Bunches of Oats’…is there really only one cup of flour in this beautiful cake? I keep re-reading the recipe, and even with my double vision, I can only see one cup of cake flour listed. I don’t have that wondrous angelica, but there’s a mission upon this horizon. This has to be one of my favorite posts by you. Beautifully written! David, Iranians also make pickled angelica from the stems, and I’ve known people in the Bay Area to hunt it in the hills of the south bay for this purpose. Only good when very young. I am a fan of that book as well. Reminds you of a different time… even when deGroot wrote it was an anachronism. Hopefully your lovely piece will steer your readers to pick up a copy… the cake is spectacular too. Bravo. This post reminded me, I’m not sure why…, of Gateau Basque. I would love to know the secrets of this delicious cake. Any chance of a future post? There’s my favorite recipe for Gâteau Basque in my book, Ready for Dessert – enjoy! David, I forgot to mention that at the Iranian stores the angelica seeds are usually labelled as “golpar.” It isn’t really the same plant as the one that grows in Europe, but it’s in the same family. Sometimes the seeds are sold whole (best option), sometimes they are already powdered. The scent of ground seeds is very strong and lingering, so it’s best to store the powder well-wrapped and well-sealed. Either way, the powder is wonderful sprinkled on potatoes or beans, especially on fava beans. The piece on this book at Amazon says that DeGroot lost most of his sight during the London Blitz. I’m sure that sharpened his other senses. I am amused at those who talk about 1973 as though it was back in the First Ice Age. The great American food and wine surge – and the term “foodie” – all date to the 70s when French chefs came to America and had wonderful restaurants in NYC and in the Los Angeles area, and French wines were flowing, never mind the price. Julia Child was having a field day with making French food accessible to Americans via her book and her television shows. The Napa Valley in California was also a burgoning food and wine center. The good life – excellent food, excellent wine. Wouldn’t have missed it for the world. Now, about this book. I would love to have a copy. The hardcover editions, when available, appear to be very pricey ($200+), Is the paperback nicely done? I’ve not seen the hardcover but since it’s out-of-print edition, it’s likely in the “collectable” range, and the price reflects that. The paperback version is very nicely done and I believe the typography is the same as the original. PS. The French had been cooking wonderfully for centuries. Went looking for more information on angelica. I had only seen it used by cake decorators to make green stems and leaves. For some reason, when summer comes, I want to read books about delicious food and beautiful places. I don’t want to stretch my mind, I just want to laugh, be inspired and/or transported. This book sounds lovely and perfect for reading right now. By the way, so is YOUR book, The Sweet Life in Paris! I actually got my original copy at Kitchen Arts and Letters. Perhaps one of the best cookbooks every. The recipies are great but that’s not even why I consider it a masterpiece. It’s up there with “How to Eat A Wolf”. I lost my copy of it in a basement flood in NJ. Thank you for letting me know it’s now in print again. Hello, my friend sent me your post since I live in Savoie (lucky me!) I’m pretty sure chef Marc Veyrat (I’m not sure about the spelling of his name, it’s a common name around here-Annecy lake- but with lots of different spellings) picks his dandelions and maybe angelica up here in the mountains himself, as he does with all kinds of herbs and flowers that he uses in the amazing cuisine of his! Incidentally, my parents live less than 100 miles from Niort, and the Marais Poitevin is just a gorgeous place, and i’m sure folks over there will be able to tell you where to find ” l’Angélique”. A few years ago my husband and I used to live in Haute Normandie, and there was this incredible inn, called “L’auberge des vieux plats” where the owner was an old lady everyone called Mademoiselle, I think she was 83 years old when we left; she was an amazing cook and she wrote a book with ancient recipes and incredible menus cooked by her brother at the beginning of the 20th century and even before. (people could eat so much back then it seems!) It’s in Gonneville La Mallée (not far from Etretat and Le Havre), and it was just fantastic! (a number of famous writers and painters, and other historically famous people visited, it’s in the book.) You should go see it! In lieu of the angelica I chopped up some fresh spearmint that I had in the garden and added that into the batter while folding in the flour. The cake seemed a little dry, even with the compote, so I drizzled a bit of black cherry flavored rum onto it and that seemed to do the trick. I am so tickled to find that others love this book. It has always been one of my favorites, and my copy is getting well worn. I too, pull it out on occasion and re-read it for pleasure. I always thought I would cook from it, but never have. There is one dessert in there that has always drawn me, the fresh raspberry tart, that is barely cooked. It is made to sound so ethereal and delicious in the book.. Maybe this will be the year I will make it..
Now, I am going to go pull out my copy and enjoy immersing myself in it. Wonderful post David this book has been among my collection for over 30 years, I will be reading it again soon, thank you! I ran across and bought the book years ago, drove past the inn more recently (it looked really lovely), and see that it appears to still exist according to its website, albeit without the original owners. David, I have to tell you a funny story about Gâteau de Savoie. A French friend of ours made it for us several times, I think it’s the only thing she ever bakes. And sometimes it was pretty good, and sometimes it was pretty terrible. She confessed that she had no idea why it turned out so differently each time. So I quizzed her: same recipe? Yes. Same ingredients? Yes. Same oven temperature? Why no, she said, sometimes I put it in a hot oven and sometimes in a cold oven. She was utterly flabbergasted when I told her NEVER to bake a cake in a cold oven. Your recipe looks much more delicious, and I have a ton of angelica growing in my garden. oh wow i wish i knew where to find angelica. thanks for sharing this lovely recipe and book tip. I enjoy your column very much and this is the first time I am writing to you — so first of all thank you! Special favorites are the recipe for chicken with shallots and a bit of soy sauce and the open faced tomato tarte with mustard. Re today’s recipe: I don’t have a stand mixer but only a hand mixer; in such situations I whip the egg whites first (they will remain stable long enough because of the cream of tartar). Then I just wipe off the beaters with a paper towel and I beat the yolks second. It isn’t necessary to wash and dry the beaters if you do it in that sequence rather than the other way around — the yolks don’t mind a bit of white in them but the whites any trace of yolk. The meals served at the auberge sound like a dream come true. We had Angelica Ice Cream at Charlie Trotter’s – they grew the herb in their Chicago garden, paired with Michigan raspberries and blackberries. I’ve always loved de Groot’s work, but wasn’t familiar with that book. Due to your recommendation, I’m sure, it is a best seller on Amazon at the moment. I’ll be buying it too. Hope all is well–loved your sink purchasing tale. We do take things for granted here–when I went shopping for my new sink a few years back I insisted on a double one with the larger portion being large enough to easily hold a 14-inch skillet with a regular-length handle. And I could have gotten even larger! Wow I was seriously inspired by this blog post. I was falling into a “cooking rut,” if you will, and until I saw that recommendation on that book I started looking into to it more deeply. I am happy to say I ordered a book from amazon! I just visited Paris and had your trusty tips for delicious food in Paris in my pocket (btw: When is your app available for android??). But I had to find out the hard way that there is no Ponzetto on the adress you mention! I wanted to try it so badly. So we went to Berthillion and snapped a cone at Amerino. You were right, Berthillion is good ice cream, but overrated.But the alfonso mango ice cream at Amerino was the best mango ice cream I ever had! I was in heaven, just amazing, the Pistachio was really great too. Thank you so much for your guidance it is so helpful and delicious to know where to go in Paris! This post was so wonderfully written, I felt not only taken on a journey, but also an aching sense of nostalgia that was not my own. Thank you. I’ve just returned home from a wonderful trip to Europe. We spent the last four days in Paris and of course visited Denise Acabo at her wonderful candy shop. You’ve probably answered this question a million times, but is there anywhere in the States that sells Bernachon chocolates? Or any mail order shop? I may have to make a return trip just to buy the orange chocolate bars! I’ve never tasted anything as good. I’m kicking myself for not buying all she had in her store. Thanks for all the tips about Paris! carla: The Paris Pastry guide is available as an eBook, in a format designed to work with Android devices. Pozzetto is still on the rue de Roi de Sicile, which I just passed the other day. They do not update their website – unfortunately – but I did see it still there. Betsey: Glad you liked the chocolate! Bernachon chocolate, to the best of my knowledge, is only available at their shop in Lyon and at A l’Etoile d’Or. This is such a fabulous and inspiring post. I hadn’t heard of that book before and now I’m really looking forward to reading it! Oh, and I used to grow angelica on my balcony. Lucky you to find non-lurid green candied angelica! I just came home from a night shift, and was surfing my favourite sites while eating some fresh berries for breakfast… I checked yours and am now going to sleep with some lovely images in my head! What a vividly written piece- all my senses have been engaged with it! I, too, loved this book and have an old tattered copy. Thanks for the reminder. A large specimen of angelica is growing on our CSA farm here in Germany and is currently in bloom. Following the recipe from Culinate linked here, I will try to candy some to make this luscious-sounding cake. If you know someone with a garden there in Paris, I can send you some seeds in a month or two when they ripen. This was a lovely post. Going to check out this book. Thanks. I bought a paperback copy on Amazon a few years ago. I think it is still available for anyone interested. The book can be had easily through amazon, no need to run around searching for it in bookstores. Et n´est pas belle la vie? 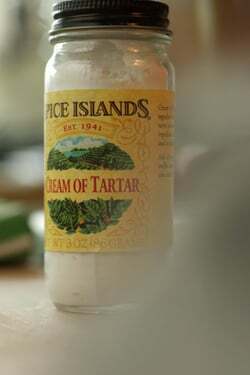 You can buy cream of tartar from Epicerie Anglaise at République – €3,50 for 140g. I love Auberge so much. I bought a farmhouse in the Dordogne in 1990 and took it there to launch my kitchen. I have so many divine memories of dishes I made from it. I’m so happy to read of your respect for it. The book sounds wonderful, David, and the cake looks good, especially with that cherry compote. They can sell you seeds, roots, etc., though I am not sure whether they will ship to wherever you might be.